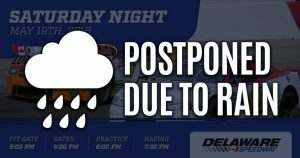 Delaware Speedway has elected to postpone Saturday May 19th’s event due to the forecast. The event does not have a rescheduled date as of now but if one becomes available it will be announced. Officials decided it was in the best interest of the race fans and drivers to call of the scheduled event with plenty of notice. Officials apologize for any inconvenience this may cause.